November 30, 2016: A large fire burned north of Kansas City International Airport on Tuesday night. 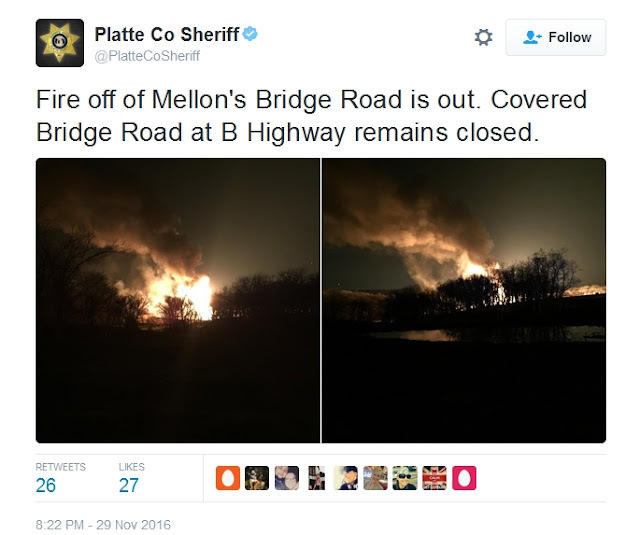 A reported pipeline explosion happened in the 9600 block of Mellon's Bridge Road at about 6:30 p.m. according to the Platte County Sheriff's Office. "The fire was limited to that at this time, it's out in the field away from any residences. Currently the gas company is working on getting the gas to the pipeline shut down on both sides, and the last I heard is the pressure is going down and the fire will actually be out shortly," Sergeant Jeffrey Shanks said. The fire was in a field and there is a limited amount of damage, however, there are also limited access points for firefighters. "We are just trying to keep the area contained, we are trying to have a perimeter set up, directing traffic to allow the fire crews to do what they need to do, have the gas company get in and get the pipeline shut down and access for damages and repairs," Sgt. Shanks said. Rick Rainey, VP of Public Relations for Enterprise Products Partners, told FOX 4 they responded to the site and an emergency protocol was initiated. The affected segment of the pipeline was isolated, a mix of ethane and propane remained. No injuries were reported and the cause is under investigation. 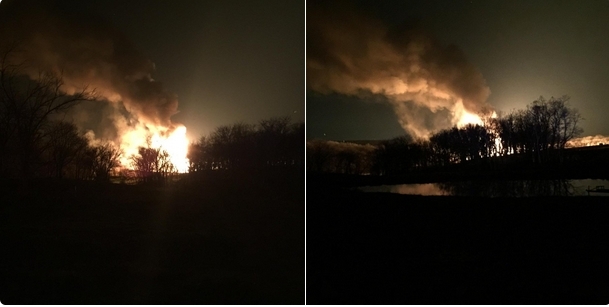 Responses to "Large Gas Pipeline Explosion Reported in Missouri"